Ever since the first project at Art School in Great Yarmouth, Giles has been fascinated with collage. There’s something about the ready made palette of colours, tones and textures in cuttings of magazine photography that springs to life in a new way when applied to represent something completely different. A couple of collage illustrations were commissiooned for book covers by Longman, but it wasn’t until a friend was looking for contributions for the Derby Six Streets Art Festival in 2015, that Giles really discovered how effective magazine collage could be in depicting a landscape. 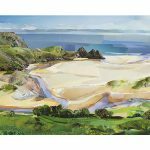 After much encouragement Giles Davies Landscapes was born, and now – when he’s not at the drawing board or cutting mat – he enjoys taking reference photos of the rich diversity of inspirational landscapes – particularly close to home in the Peak District, and around the Welsh coastline. He doesn’t see the endless supply of magazines running out any time soon! 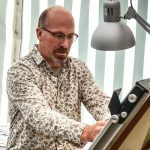 Giles sells prints; runs workshops and will tackle commissions. 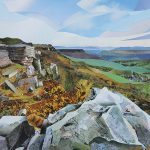 In this workshop you will learn the wonderful art of collage and create your very own landscape piece. All materials and refreshments are included. Please bring your own lunch.